This fun-filled, hands-on camp is perfect for your aspiring aviator. 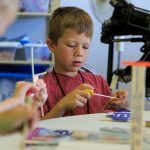 Campers learn the principles of aviation, build a radio-control airplane and pilot a real airplane over Vancouver. Field trips, include visiting both the air traffic control tower and the Alaska/Horizon facility at Portland International Airport, Fern Prairie at the Port of Camas/Washougal, and Cascadia Technical Academy. Spaces fill quickly, register today! Contact Deborah Barton at 360-992-1815 or deborah.barton@www.thehistorictrust.org.